I took this picture last November when my neighbor’s granddaughter Elena Tracy was visiting Johnstown from Wilmington, NC. I have all boys, so I love when I get the chance to buy dresses for girls and take their pictures all dolled up! This dress was a bit big on her and we had to clip the back to make it fit a bit better. 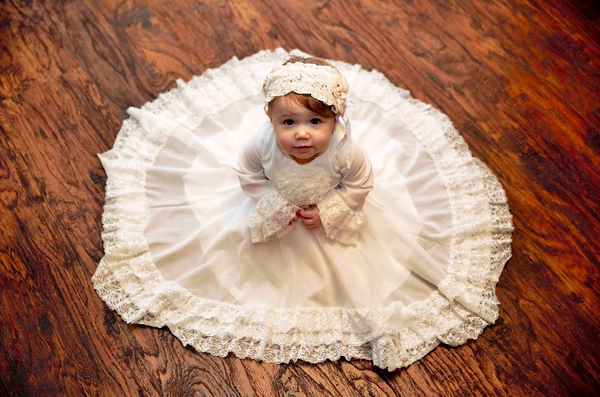 My neighbor had beautiful hardwood floors installed, and it makes her white dress stand out. I stood up on one of their chairs to get a better angle of the dress being spread out, and Elena’s grandparents and parents were singing and clapping to get her to look up for the camera. We laughed and had a great time. I had this picture made on a large canvas and gave it to my neighbor, Trish Scholly, as her Christmas gift. I also displayed this picture at the recent Johnstown Bridal Showcase and was asked about it numerous times.